A soft-flex (for a “RaceCarve” ski), traditional wood-core sandwich construction ski with a VIST TT Pro Race plate. Excellent fit-and-finish. Very nice workmanship. Cool black satin, fish-scale texture topsheet. Damp feel by hand tests. Exact dimensions as my current racecarve ski (’05-’06 Nordica SpeedMachine 16.1 178cm), so the geometry should be excellent and prove to be a good comparison test. The soft flex pattern with plate should be excellent for all conditions, good grip on hard snow due to the VIST plate. Probably less “race-oriented” than my SpeedMachine, but better in softer snow or broken-surface conditions. Squeeky-cold, dry New England hardpack, fresh packed powder, spring-like cupcake frosting surfaces. 12 degrees F to 50 degrees F.
My initial turns discovered these skis have two pronounced elements to their performance...moreso than some other skis. One is what I call the “edging angle” and the other is what I call “Speed-dependent radius”. If you get the right combination of both…you suddenly have a wonderful ride with no upper speed limit. Trying to over-angle the ski at slow speeds results in a wash-out of the forebody or tail (depending on your stance and weighting). This is typical of any ski, but due to the soft nature of this ski’s flex pattern, more pronounced since either the forebody or tail would wash…but not both. 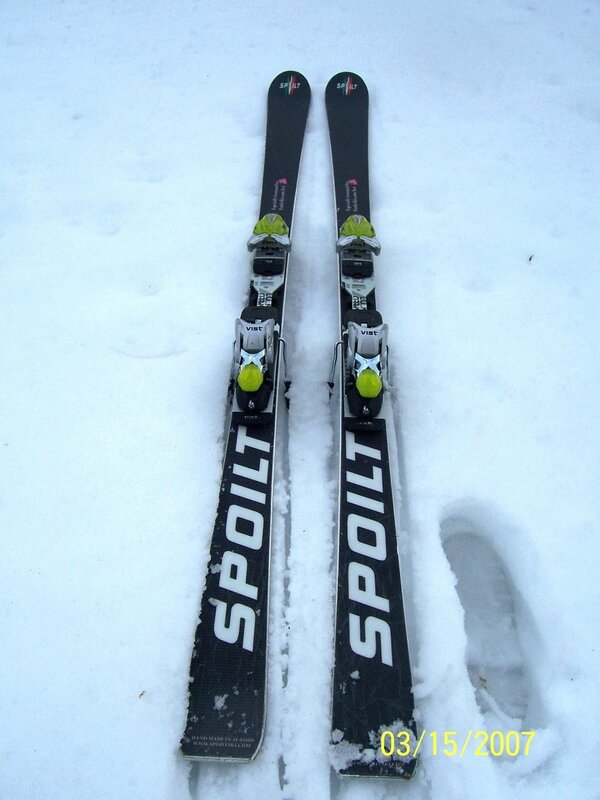 A stiffer ski (like a pure race skis) simply washes-out entirely fore and aft until you get a grip on it. Once you reach 15 or 20 mph, experimenting with various edge angles and turn radii results in the ski suddenly falling effortlessly into its “groove”. Below the “engagement speed”, there is no “groove”, simply a normal skidding set of turns like any ski. Get it into its “zone”…and Oh Boy….I have fallen in Love with this mysterious Italian. This ski loves to be ridden in its optimal radius at its optimal speed and once in its “zone”, becomes effortless and silky. In the “zone”, this ski is infallible and no terrain irregularities can cause it to deviate from your specified course. Never difficult to turn. Never tiring. Never demanding. No hint of “race ski” vigilance required. Just ride it as it arcs from left to right. Turn response is excellent. You can change direction instantly at will without any protest. Don’t push it. Just roll it over, pressure it and ride the rail. It never demands to be “on-edge” all the time like some race-carve skis. Perfectly happy to drift and wash itself through a turn, or roll it onto its optimal angle and hook-up a perfect carved arc with any degree of pressure you wish. No hint of any nervousness or twitching at warp-speeds (especially notable for such an easy-to-turn ski), it just lays securely on the snow waiting for your next command. You can ski this one all day and not get tired, but still lay down some deep carving trenches on the trail you can admire going up the lift. I would say this ski (in its default construction – you can get it custom built if you wish) is more oriented toward the “all mountain expert carver” rather than “race-carver”. When compared to my Nordica SpeedMachine 16.1, the Spoilt RaceCarve is softer, more forgiving and definitely more versatile for all-day, any terrain. The SpeedMachines would be better in a racecourse, but more tiring and less friendly when the surface isn’t groomed hardpack. At warp-speed, if I jam on the SpeedMachines hard to change direction, I could get into trouble. On the Spoilt RaceCarves, nothing bad could happen…I would just change direction securely without any risk of “explosion”. No danger, just obedience. (Although I love the explosions a few times a day on a race-type ski) I love the unique personality of this ski and its feel under my feet. Very, very fast bases. Superb ski, considering it was built by a couple guys in a tiny shop. Very cool., and definitely a conversation-starter. Everyone wanted to know about them and try them! Try them in a 174cm length. Try them with another sheet of metal in the sandwich. Try adjusting the VIST mounting points one notch forward and one notch backward for fun. Go to Italy and meet the Mazzoni brothers. Own a pair with my own graphics. The Proto line, entirely custom built, was created to satisfy the most demanding customer. In order to meet the individual requirements of each customer e.g. ski’s length, edge’s length, sidecut, radius profile, flexes and consequently all the materials, different combinations of laminated woods, fibers and their own layout. Also to obtain a unique ski it is possible to personalize the graphic and the design as per the customer’s own tastes. The time of delivery is considerably long (about 6 months), due to the construction of the templates and the molds. The Limited Edition line, entirely custom built, in the same way as the SPOILT line is constructed only with top materials and comes directly from our prototypes, has predefined measurements (effective length and waist, sidecut, etc) and also available with the flex and the graphic personalized. The time of delivery is between 2 and 3 weeks. The SPOILT line is our ready to go version, a small assembly also produced with top materials available in the market. These skis are based from our experience with our prototypes tested all over the Alps. Available on order from our dealers (see contacts). The time of delivery is approximately of 6 or 7 days. This ski felt VERY solid under foot. It has superior edge hold. I was surprised at its ability to complete short swing turns, considering the VIST plate mounted under the binding. The ski performed well in the soft bumps. Snow conditions were very soft, packed powder. My feeling is the ski would excel on hard pack, racecourse conditions. Really liked the looks of the top sheet…its cool. Top sheet held up well when my young niece ran over it! I took a bunch of runs on the Spoilt Race Carve at Killington on groomed changeable snow conditions and found it to be a great pair of skis. The first few turns were a little dicey. It didn't seem to want to behave at the slower speeds and actually felt a little clunky edge to edge at slower startup speeds. Once it got up to its cruising speed, everything changed and its personality began to show. Very responsive edge to edge, very smooth in the transitions turn to turn. The faster you went, the better it got,well like an Italian sports car(excuse the pun!) Totally safe feeling at speed, comfortable and predictable. It never rocked you out of the turns but never left you feeling like you were hanging on for dear life. Great control and responsiveness at cruising speed,would not be pushed out of its turn radii, would not wash out of turns,stuck to its radii from start to finish. Left great railroad tracks! The construction is dead on. Nothing wrong with the layup of this ski. Only draw back is the slow response at slower speeds. Easy to fix this,just point them down the hill until you find that speed! Great cosmetics, and dimpled topskin. Came with a VIST race plate and bindings. On a scale of 1 -10, give this ski a 9. I would feel better about these skis if didn't feel so weird getting up to cruising altitude. This takes away from that important first impression. Otherwise, an excellent ride to add to your quiver! I got out on the Spoilt RaceCarves again on a bluebird spring corn day before the Beast of The East closed...comparing skis again with several other skiers and different pairs of skis, and these boards came back like a great freind...excellent handling, no upper speed limit and really, really nice feel underfoot..even in the bottomless corn. Impressive ski, can't wait to get on some more skis made by the Mazzoni brothers in Alassio, Italy. Nice work. I'm keeping these skis. on the scale i would rate these 9 of 10. if i were to purchased a pair i would go longer....they did ski a little short, more like a 170 cm. I would like to see how the 186 or even a 189 felt. On the construction....well they were just a perfect. Nice vertical sides, clean line, fast bases. I will be suprised if I don't see a few more pairs floating around in 08. in a time when fat & 120 mm is trendy, even if only functional in the liftline, it is refreshing to see a quality ski that improves your skiing & is wildy cool. This ski is all but the same as the Hart Phoenix, I am 99.94% sure these are hand built by the same person. Having skied this ski and the Phoenix back to back with and without the Vist plate, there is no denying that the Vist supercharges this ski. Having skied both the Spoilt & the Hart, I would have to agree that they are the same ski. I found this to be one of the best exotics that I have tested & the one w/ the broadest consumer appeal. You reall can't go wrong w/ this one.